The other night, Jacque and I were in her yard, playing with the dogs. I went in to get my camera and closed the door when I came back out. "You didn't just lock us out did you?" Whoops! Hey the air conditioner was on and my momma taught me well and . . . I didn't know it would lock behind me! Luckily, Jacque had already been through the being locked out thing once and wasn't about to do it again. There's some secret place with a secret key. I don't know where the key is, and really have no need to know. But I followed her, apologizing profusely. Jacque started giving me funny looks and stopped heading toward the gate. I realized she was trying to lose me! Jacque and I have been friends for a long time, now! I was sure she thought she could trust me! "Do you not want me to know where the key is???" "Are you serious? What do you think I'm going to do? Come in when you're gone and steal stuff?" "Well, what if you get mad at me someday?" Please! She should know I just use the doggie door when I want to sneak in! Tonight, I showed up so we could go get Blizzards at Dairy Queen. Those Key Lime Pie Blizzards rock your world! I ran the doorbell and waited patiently. I waited some more. And then a little more and still no answer. She was supposed to be waiting for me, so I kinda got a little nervous. Should I go in? What if something was wrong? Surely she's just changing her clothes or something . . .
And because I'm the kind of person who doesn't bust into someone's house without permission, I waited a little more and then rang again. It turns out, Jacque had just been letting the dogs out so we were ready to get ice cream. I got my precious Key Lime and Jacque got some kind of chocolate concoction. We got back and sat in the living room. On Jacque's first bite, plop! 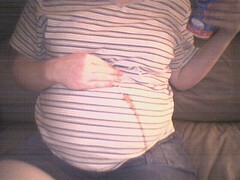 Chocolate ice cream all over Baby Fed! I tell you, this Chocolate Ice Cream on White Shirt phenomenon is getting out of control!